About This Painting: News Yeara Eve has come and gone and now the Party is over. Take off yur make up and clean up. Time to start a New Year. About This Painting: Every since I sawHenry Moore's Sheep Sketchbook, I have been in love with sheep. About This Painting: I am really enjoying painting these small whimsical birds. I think I still have a few more to go before I tire of them. This is an oil painting on canvas mounted on a museum quality panel that is ready to frame. About This Painting: Another one in my Tooth Fairy Series, this hard working Fairy has made a fair exchange for the tooth and soon will be on her way after a little rest for her wings. 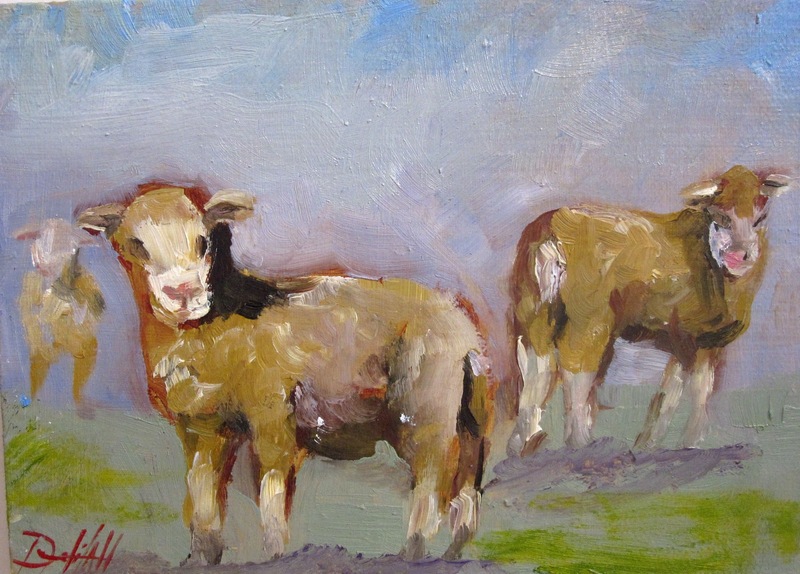 About This Painting:These sheep have a golden fleece. I'm not Jason or an argonaut but I did find a nice golden fleece here. 5x7 oil painting on canvas mounted on museum quality panel ready to frame. 6x6 oil painting on stretched gallery wrapped canvas. A jam session of improvising a little Christmas Cheer. This is an oil painting on canvas mounted on a museum quality panel. It is ready to frame.The painting is 5x7. About This Painting: Three chubby birds try to stay on a tiny branch as the cold winter wind blows them up and down. About This Painting:This Fairy is checking out her latest find. Tea bags hung out to dry while a bird stops by to see it all. 6x12 oil painting on gallery wrapped stretched canvas. This is a watercolor painted on 140 lb cold pressed watercolor paper. It is 12x18. 14x11 oil painting on gallery wrapped stretched canvas. 8x10 oil painting on stretched canvas with painted sides. Watercolor painting on 140 lb coldpressed watercolor paper. 7x5 oil painting in canvas mounted on a museum quality panel ready to frame. About This Painting:It's time to party down on the farm. The Conga Chickens,Zoro the Party Pig and one of Santas Raindeer are having a little Christmas cheer. 12x9 watercolor on 140 lb cold pressed watercolor paper. 5c7 oil painting on canvas mounted on museum quality panel ready to frame. This is a watercolor painted on 140 lb cold pressed watercolor paper. It is 12 x 9. This is a 5x7 oil painting. It is painted on canvas that has been mounted on hardboard and is ready to frame.